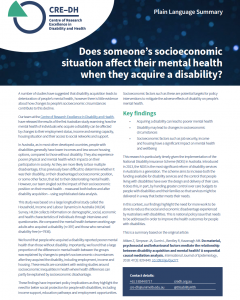 Does someone’s socioeconomic situation affect their mental health when they acquire a disability? A number of studies have suggested that disability acquisition leads to deterioration of people’s mental health, however there is little evidence about how changes to people’s socioeconomic circumstances contribute to this decline. Our team at the Centre of Research Excellence in Disability and Health, have released the results of the first Australian study examining how the mental health of individuals who acquire a disability can be affected by changes to their employment status, their income and earning capacity, their housing situation and their access to social networks and support. In Australia, as in most other developed countries, people with disabilities generally have lower incomes and less secure housing options, compared to those without disability. They also experience poorer physical and mental health which impacts on their participation in society. As they are more likely to face multiple disadvantage, it has previously been difficult to determine whether it was their disability, or their disadvantaged socioeconomic position, or some other factor, that led to their deteriorating mental health. However, our team singled out the impact of their socioeconomic position on their mental health – measured both before and after disability acquisition – using sophisticated data analysis. This study was based on a large longitudinal study called the Household, Income and Labour Dynamics in Australia (HILDA) Survey. The HILDA survey collects information on demographic, social, economic and health characteristics of individuals through interviews and questionaries. We compared the mental health between working age adults who acquired a disability (n=397) and those who remained disability-free (n=7936). In our study, we found that people who acquired a disability reported poorer mental health than those without disability. Importantly, we found that a large proportion of the difference in mental health between the groups was explained by changes to people’s socioeconomic circumstances after they acquired the disability, including employment, income and housing. These results are consistent with existing studies around socioeconomic inequalities in health where health differences can partly be explained by socioeconomic disadvantage. These findings have important policy implications as they highlight the need for better social protection for people with disabilities, including income support, education pathways and employment opportunities. Socioeconomic factors such as these are potential targets for policy interventions to mitigate the adverse effects of disability on people’s mental health. This research is particularly timely given the implementation of the National Disability Insurance Scheme (NDIS) in Australia. Introduced in 2013, the NDIS is the most significant reform of disability services in Australia in a generation. The scheme aims to increase both the funding available for disability services and the control that people living with disabilities have over the design and delivery of their care. It does this, in part, by handing greater control over care budgets to people with disabilities and their families so that services might be delivered in a way that better meets their needs. In this context, our findings highlight the need for more work to be done to reduce the social and economic disadvantage experienced by Australians with disabilities. This is national policy issue that needs to be addressed in order to improve the health outcomes for people with disabilities. Aitken Z, Simpson JA, Gurrin L, Bentley R & Kavanagh AM. Do material, psychosocial and behavioural factors mediate the relationship between disability acquisition and mental health? A sequential causal mediation analysis. International Journal of Epidemiology, 2018: 47(3): 829‐840.